To see this on the big screen enhances the spellbinding sets and cgi that were used within this film however that being said sadly was all to look forward too. I am still shaking my head to people that are comparing this to the Victor Fleming directed 1939 original starring Judy Garland, either stating that it was just as good or if not better!! There should be no comparison of the two cause they are night and day in my opinion. James Franco as an actor has more downs then ups and this most certainly is a down yet once again. I know this dude has acting chops however only chooses to emit them on occasion. 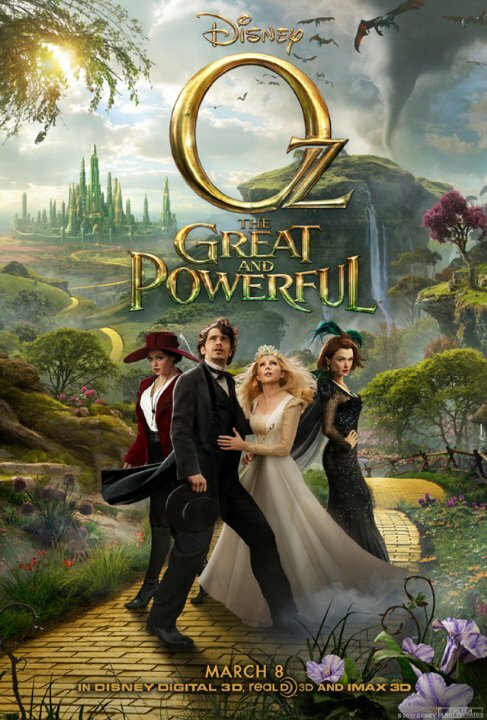 Director Sam Raimi should be severly scolded for casting him as Oz the great as it totally fell flat. Another problem was casting Mena Kunis (Ted, That 70's Show) as the evil wicked witch of the west although she is very..very easy on the eyes she is still a very young actress who needs more time in drama class. Aside from those negative casts if you are a fan of both CGI and eye candy backdrops then by all means..if not wait for the dvd release on this one. Have to agree with you on James Franco, He should really pick his scripts/films to work on. Just amazing in various films such as 127 Hours.